Review by AllTheBestFights.com: 2015-05-15, good start but the rest of the fight was not so exciting: Brandon Halsey vs Kendall Grove gets two stars. The undefeated Brandon Halsey entered this fight with a perfect mma reord of 8-0-0 (62% finishing rate) and he is ranked as the No.19 middleweight in the world. He fought three times last year beating Joe Pacheco, Brett Cooper (final of the Bellator Mw tournament – season ten, Cooper vs Halsey) and Alexander Shlemenko (fight valid for the Bellator Mw title, Shlemenko vs Halsey). His opponent, the black belt in Brazilian jiu-jitsu Kendall Grove, has an official record of 21-14-0 (71% finishing rate) and he entered as the No.52 in the same weight class. He fought twice in 2014 losing to Brett Cooper (=Cooper vs Grove) but then he came back to win defeating Christian M’Pumbu (=Grove vs M’Pumbu). 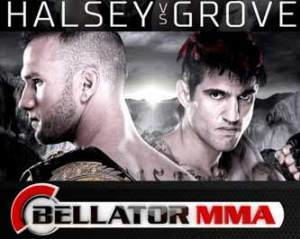 Halsey vs Grove, main event of Bellator 137, is valid for the Bellator middleweight title (Halsey’s first defense). Watch the video and rate this fight!